Miriam de Saram was so much a part of my childhood and adolescence that it is hard for me to realise that she is no more. She was not merely my father's cousin, but one of my mother's dearest friends. The two of them, together with two other kindred spirits among their relatives (Nedra Obeyesekere de Saram and Prini Molamure Deraniyagala), made up a formidable quartette. Miriam, who was, I believe, the eldest of the four, outlived them all. Her life, which virtually spanned our century, touched many areas of Sri Lanka's cultural life, for this gifted lady made her personal contribution to its dance, its theatre, and even (in her 80's) to its poetry; through her talented sons Rohan, Skanda and Druvanand, to its scientific advancement and its music; and through her daughter Niloo to its visual arts. Miriam was the only daughter of the historian Sir Paulus Pieris and his wife, the heiress Lady Hilda Obeyesekere Pieris (a patron in her own right of the arts and of education in Sri Lanka). She was the sister of eminent scientist and zoologist Paul Pieris Deraniyagala, of civil servant and Clerk of the House of Representatives Ralph St Louis Pieris Deraniyagala, and of one of this country's best-known artists, Justin Pieris Deraniyagala. Miriam chose to pursue the arts, studying music and dance in India and later in London, where she lent her dancing talent to Alexander Korda's film about British colonial life in India, "The Drum". While resident in London, she became an exotic addition to the artistic and literary circle that centred upon Fitzroy Street, the magazine "Poetry London", and its mercurial editor James Meary Tambimuttu. Years later, when I was a student at Cambridge University, the English poet Kathleen Raine who, with her husband, had also been a member of that extraordinary and gifted group, described to me the impact upon them all of Miriam's vivid personality and her equally arresting 'oriental' clothes. Miriam's marriage to Robert de Saram took her out of her conservative family circle and into a different community with its own unconventional way of life. She maintained and enjoyed her connections with members of her own family who shared her interests in the arts, but her marriage to gentle, music-loving Robert gave her the space she needed to develop her personality and her talents to their fullest degree. I remember them both as a thoroughly modern couple, and my aunt as well-informed and formidably well-read, enjoying close friendships with artists and writers inside and outside the family circle. At the same time, she poured her intense energy into the care of a growing family of healthy, happy children, and into encouraging the talents of the young. Some people will remember Miriam on the stage, in Jubal's "Lower Depths". 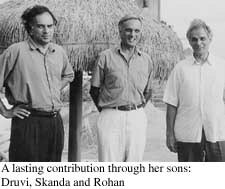 Others will remember her as the guiding hand behind her son Rohan's musical education and his later outstanding career. My own most treasured memory is that of Miriam de Saram driving her car. "There's a rear-light missing on my car? Goodness, officer, thank you so much for telling me. You've probably saved my life - I had absolutely no idea ..... I'll have it seen to at once." As she drove away, Miriam would turn amusedly to my mother and myself: "That rear-light hasn't been functioning since 1952 ..."
Miriam's qualities of character were original and distinctive. What I remember best is the intensity with which she focused on matters that interested her, the energy with which she promoted them, and the resilience with which she accepted occasional disappointment when her plans did not work out. In an ideal society - one which genuinely respected the abilities of women and acknowledged their right to shape their individual destinies equally with men - one cannot help speculating on what Miriam might have become. Perhaps Miriam de Saram was born a century too soon. Looking back at her long life one can truly say that she adorned and enriched the century in which she did live, giving continuity in her own way to the intellectual and artistic traditions of her family, and making a lasting contribution through her children and her grandchildren to the country she loved. The early years of my childhood are times I will always cherish. The joy these years brought me is partly due to one special person - my grandmother. As a young child, I grew up in my ancestral home where my paternal grandmother had lived from the time of her youth. There she would be, often sitting in the large verandah, on that long wooden Dutch couch, looking out into the garden or reading a book. My grandmother was a striking figure. Every morning after my bath, my nanny would take me to the front garden, and I would sit under the large fruit tree, playing with my toys. My grandmother, about seventy-five years old then, would soon join me. She would inquire how I had slept and what I had planned for the day. I used to enjoy talking to her. What enthralled me was the way she could bring herself down to the level of a child, and I would feel as if she were my own age. My grandmother would relate stories of her experience in the Pyrenees where she had met Pablo Cassals, or she would talk, of the dance she had performed in the film, "The Drum" by Alexander Korda. She had met so many interesting people and travelled so widely, that I grew up fascinated by the stories she told us, and how descriptive they were. My grandmother had studied western and eastern dancing when she was young. I suppose it was this that made her encourage me to take up dancing later. Every evening when my parents came home from work, we would all sit on the front verandah and have tea together. My younger brother and I would interrupt the grown ups' conversation, eagerly announcing that we would dance and sing, or play a duet on the piano for them. It was on one such day that my grandmother was inspired to write a poem about us. Since then, my grandmother wrote hundreds of poems. Some of these poems have been published, and some she read at literary evenings. Whenever I visited her at the nursing home where she had been residing for a couple of years, she never failed to read to me one of her new poems. What I admired most in my grandmother was her thinking. She maintained a positive outlook towards everything. This has taught me to relate to the best side of people. It is something I will always keep in mind.